Tressie and her staff at The Austin Harmony Project bring students with special needs to the stage, propelling their self-confidence sky-high as they give heartfelt performances alongside professional musicians. 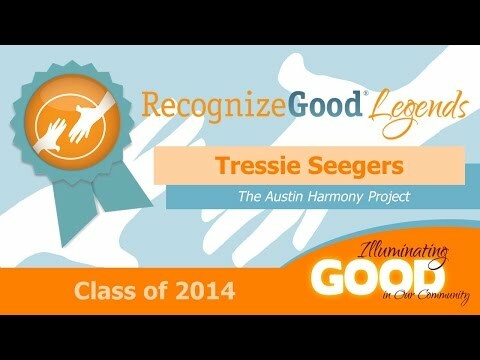 When Tressie Seegers first incorporated art and music into a life skills class serving high school-age students with developmental disabilities, she noticed something – the students’ behavior improved, self-esteem increased, and perhaps most significantly, their talents were recognized and encouraged. From that point forward, she worked to build an organization, now known as the Austin Harmony Project, enriching lives through art, music and a sense of community. Behind Tressie’s entrepreneurial spirit, young men and women with cerebral palsy, Down syndrome and autism now perform regularly as members of the Sweet Harmony Band, delighting parents, supporters and each other as they sing and dance along with some of Austin’s most popular professional musicians. In addition to performance opportunities with the Sweet Harmony Band, Austin Harmony Project participants enjoy art and music sessions five days a week along with supported employment and job training through Harmony Books, which sells donated books online and provides related jobs, as well as Harmony Thrift & Gift, which sells student art projects online. For Tressie, growing the organization and providing more opportunities for students with disabilities are “always on the front burner,” Pat says. In 2013, the Austin Harmony Project provided over 1500 art and music enrichment hours to more than 80 students.